Now to the good. 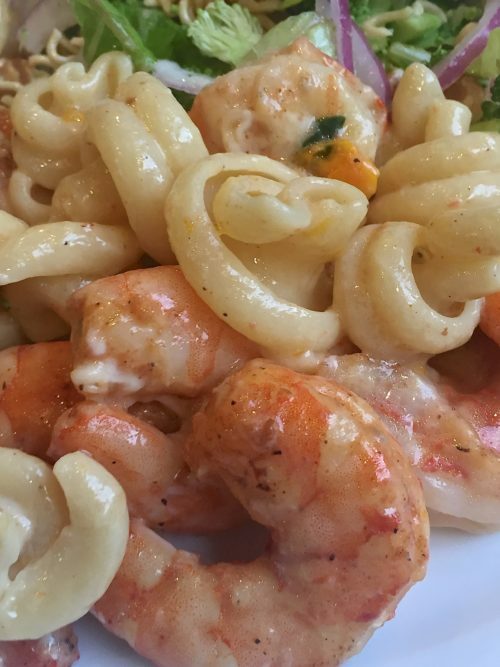 I really felt quilty eating my delicious Key Lime Shrimp and Pasta dish. It was so good and the lime flavor was so refreshing. I offered him a bite (only one) which he refused because he was waiting on his plate to be reheated. I think maybe they took the plate back and just looked at it and brought it back. So much for the SPECIAL of the evening. This dish uses trottole pasta. 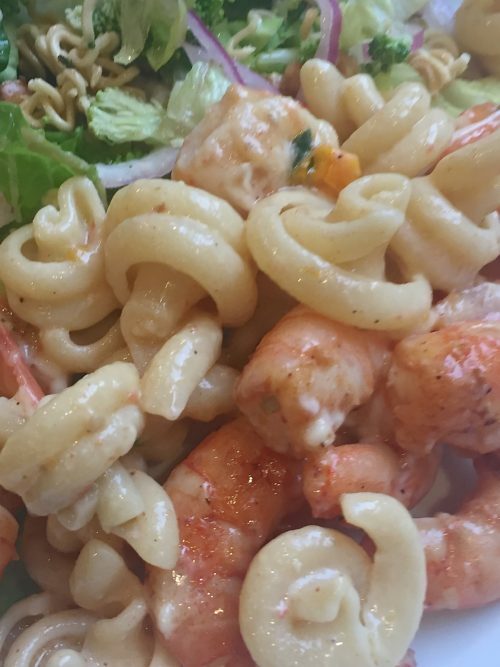 Sure, it kind of looks like corkscrew pasta but this one looks more like little spinning tops. I bought mine from Amazon because I didn’t want to search for it. Kroger’s Private Selection brand is suppose to have this pasta and I’ve found it at Tuesday Morning before. TM always have some interesting shape pasta. (NOTE: I paid $12 for mine and after checking Krogers I found it for less than $2.00 a bag — should have looked there first but when my first go to groceries didn’t have it I never thought of looking at Krogers. All pastas are basically the same ingredients but it’s the shape that counts in a lot of recipes. If you have a clingy type sauce then you want a real curvy pasta to help hold all that sauce. BLAST FROM THE PAST: If you are thinking of Fall desserts try my Pumpkin Bread Pudding with Caramel Sauce. It’s delicious. 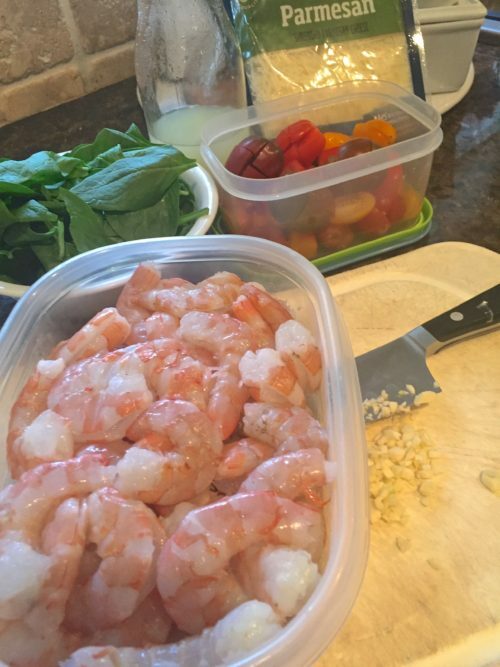 Shrimp and some of the other ingredients. I put some cajun seasoning on this and hub grilled it for me. The cooked pasta add with the sautéed tomatoes, and spinach. Stir in sauce and add some parmesan cheese. Yum. Serve with some lime slices if you want a little more tartness. 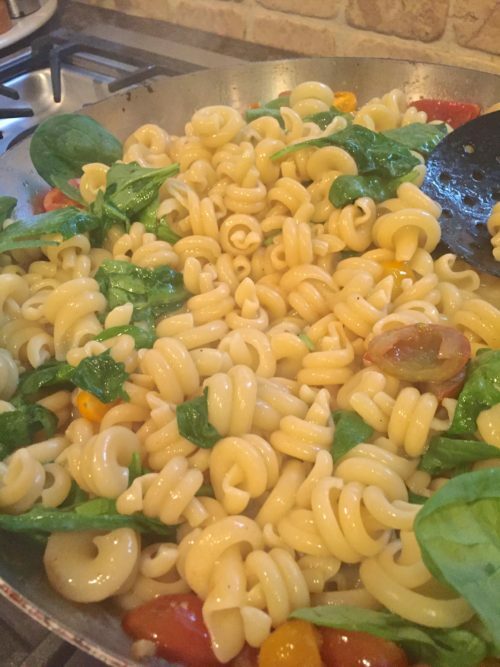 Trottole (top shaped) pasta with key lime shrimp, heirloom cherry tomatoes and fresh spinach. 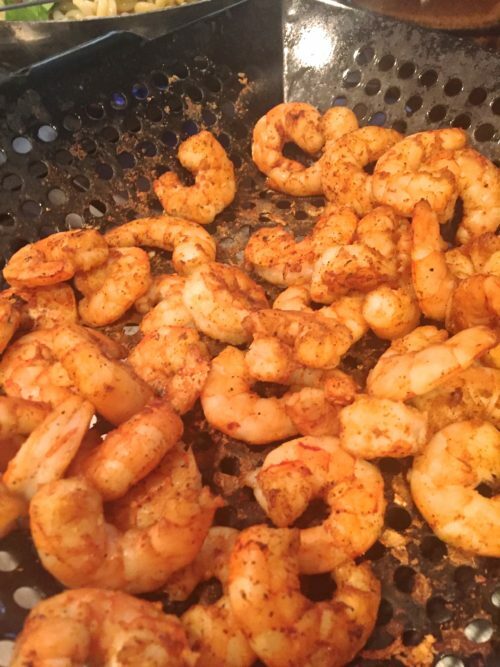 Sprinkle the cajun seasoning over the shrimp and either grill, cook in skillet or pop in oven until shrimp is done (pink). Set aside. Make the sauce and keep warm over a pan of simmering water. For Sauce: combine first five ingredients of the sauce in a small skillet; cook over medium heat until reduced to 3 tablespoons. Stir in the whipping cream and cook until reduced to 3 tablespoons. Reduce the heat to medium low and add the butter, 1 tablespoon at a time, stirring until butter melts. Remove from heat; strain through sieve. Stir in lime zest and salt. Keep warm until ready to put dish together. Cook the pasta until just al dente, drain. To a large skillet add the olive oil and when hot add in the tomatoes and sauté for 3-4 minutes. 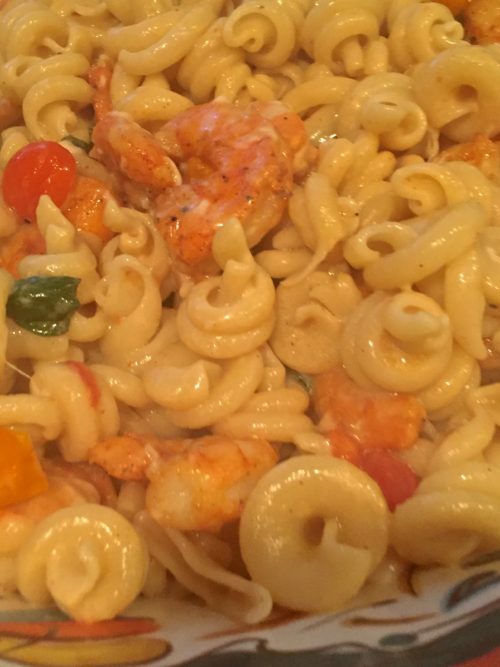 Stir in the pasta, shrimp, and spinach and add in the key lime sauce; you may not need or want all the sauce. I bought my pasta from Amazon for $12 a bag. I've bought it in specialty stores for about the same price. After "googling" I found it at Krogers for under $2.00 a bag. So look at Krogers first.